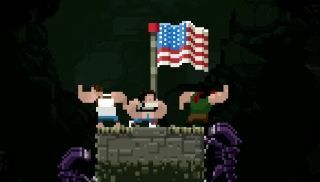 Broforce developer Free Lives is celebrating the July 4 weekend with freedom! That is, the Freedom Update, an ultra-patriotic patch that adds a pair of new Bros, new melee attacks, and "combat flexing." First on the ticket is The Brocketeer, a "Golden Age" bro who wears a jetpack and launches devastating dive bomb attacks in his fight for liberty. Joining him in the battle against tyranny is Broheart, a Scottish-American hero of legend whose cry of "Freedom!" scatters all who stand in his path. Both characters, and the rest of the Broforce, can deliver roundhouse kicks and "organ punches," and even dish out that most American form of justice: A chainsaw to the face! Wicked sick, bro! And of course, we can't forget the flexing. "No assault on terror would be complete without an impressive display of the bros' raw power, so we've introduced a new 'flexing' feature," the studio wrote. "Now you and your bros can cease-fire, flex your biceps in the face of evil, and exercise your right to bear arms so thick your shirts tear in half." The update incorporates a number of bug fixes as well, to enemies, environments, bosses, and Bros, including Ripbro, Browilliams, Bro Dredd, Mr. Anderbro, and Rambro. A "second installment" to the update, expected to live in the new few days, will also add on some new levels. Full details are up on Steam.